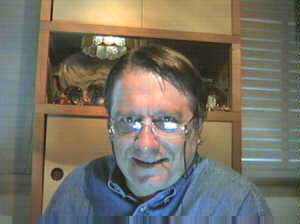 You may read about me, and my ideas, on the texts on this Site, written on several languages. In order to show myself to you I choose the picture made by Yugo Okoyama for the article "Fusca na Cabeça" (With the VW Beetle, Fusca here in Brazil, on the head) published by the Magazine "JÁ" (means: NOW), that is part of the Sunday issue of the Newspaper "Diário Popular" (Daily Popular), issue No. 145, Year 3, from 15AUG1999. This article become true due to Glenda Pereira, from the Automobile Section of the Diario Popular. She got interested in the "Save the VW Beetle Image QUEST" and brought this subject to the editors of the above mentioned Magazine. Finally Nicolau Farah bought the idea and published the article. One camera in his hands and an idea in his head. In love with Fuscas, Alexander Gromow, 52 years, is chasing images and curious objects about the famous Beetle around the planet. Everything counts: from Tyre Service Station Posters to chocolate packing, passing trough underware. Gromow already has more then 60 pictures and will conclude his work in a year, when he intends to publish the book "The VW Beetle and the Popular Art". "-I do not want that people forget the VW Beetle, but I’m running against time, beacuse many paintings are being erased, they are getting lost", he says. Who would like to know and to help in the survey must get in to the Site http://www.fuscabrasil.net/, that is dedicated to the artistic expressions that use the image of the old VW Beetle (Fusquinha - little VW Beetle: in Brazil the diminutive form is used to express affection). The idea of writing a book about this subject is still a dream, it depends much upon your help!!! Another Home Page: Fusca Brasil a Página de Alexander Gromow -will allways be under construction!! !